On a walk around the Coneyburrow Wood part of Brede High Woods, I noticed some clustered, orange brown objects uncovered in a scuffed up patch of marshy earth. These are nodules on the roots of alder trees caused by the nitrogen-fixing actinobacterium (or actinomycete), Frankia. The nitrogen provided by the bacteria in these nodules enable alders to grow well in nutrient-poor, waterlogged soils. Much of the nitrogen arriving in temperate forests comes from Frankia bacteria on this and other tree species. This soil enrichment helps to establish and maintain woodlands and other habitats, particularly where climate change or human activity disrupts ecosystems. Who would think that the tiny organisms inside these bobbly conglomerations could help to save the planet? Many fungi produce their fruiting bodies primarily in the winter and not necessarily in the places one would expect. The toadstools above are meadow waxcaps (Hygrocybe pratensis) found growing in a quite shady area of ancient woodland - wrong time and wrong place, but this species is sometimes found in these situations late in the year. Not far away I found a couple of large brackets of Dyer's mazegill (Phaeolus schweinitzii), a species that grows on conifers - in this instance on a living larch tree. The picture below shows lane to the former Brede High Farm from the Rye road. The farm was to the left of the point where the snow on the track ends. It was razed to the ground in, I think, the 1940s, rather later than the other demolitions on the Powdermill Reservoir catchment. I wonder if those who lived there would recognise the lane today with woodland where there used to be fields. By the same token it is difficult to imagine the bustle and activity, the livestock and buildings of the old farm that may have stood there for centuries but, as Villon wrote, ou sont les neiges d'antan? January has started with a countrywide chill. 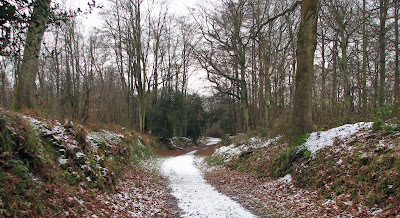 After several days of hard frost, there was a sprinkling of snow overnight whitening the tracks and paths in Brede High Woods. On this very cold morning there were more walkers than usual, drawn to see what is now a comparatively rare weather event in South East England. Deeper in the woods Brede High Pond had a covering of ice, though much more cold would be needed to freeze it hard enough for skating. The scene below reminded me of Keats's lines from La Belle Dame Sans Merci: The sedge has wither'd from the lake/And no birds sing. Despite the grey and the cold, some places remain surprisingly colourful. Here the wet bracken shone bright brown in contrast with green brambles and patches of snow.